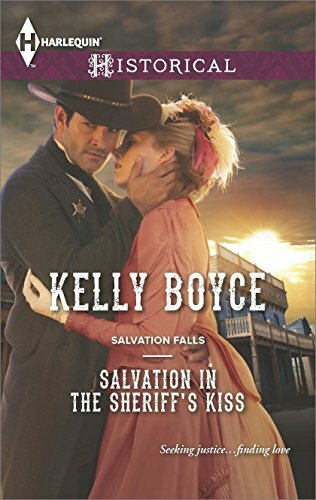 I liked Kelly Boyce’s historical western Salvation in the Rancher’s Arms, and was looking forward to Salvation in the Sheriff’s Kiss (Harlequin, 2015). Happily, I was not disappointed. This time the couple, Sheriff Hunter Donovan and Meredith Connolly, are former lovers. When her father was sent to jail for cattle rustling, Hunter dumped Meredith, telling her a dirt poor Connolly wasn’t good enough for a wealthy Donovan. She went to live with an aunt in Boston, and learned dressmaking. Seven years later, Meredith is back. Her aunt died, leaving her with enough money to return to town in style, and open a dress shop. Her father has also died, and she wants to prove he was innocent. Hunter still regrets respecting Meredith’s father’s request to send her out of town. Meredith wants nothing to do with Hunter, but despite everything she’s still attracted to him. She needs to work with him to establish her father’s innocence, and she needs to be in town to find the helpful macguffin her father left for her. The relationship problem could be resolved with a frank talk, but Boyce effectively distracts her couple and her readers with a hefty dose of suspense. Meredith is not the only recent arrival. A hard-drinking taciturn bounty hunter has brought in Bill, a man wanted in connection with the same crime that sent Meredith’s father to jail – and Bill came along willingly. A big city lawyer has arrived to defend Bill at the upcoming trial, but he won’t say who hired him – and Bill doesn’t want him. The curious Bancroft family is visiting, but they aren’t sure where they come from. To complicate matters further, Hunter suspects that his hated father, and the late former Sheriff he admired, may have been connected to what was seemingly a simple crime. Several characters warn Hunter to let sleeping dogs lie, and to keep Meredith safely out of town. The tone verges into noir at times, with characters who have nursed grudges for decades, and a wide-reaching, powerful criminal conspiracy. Meredith is a strong character from the start, and it’s largely her determination and fearlessness that resolves matters. Hunter even apologies for treating her like a damsel in distress. The story, and the couple’s relationship, are also enriched by the complex family histories of the characters. I miss the falling in love aspect of stories with former lovers, but the suspense plot and strong realistic characters make this a great read.